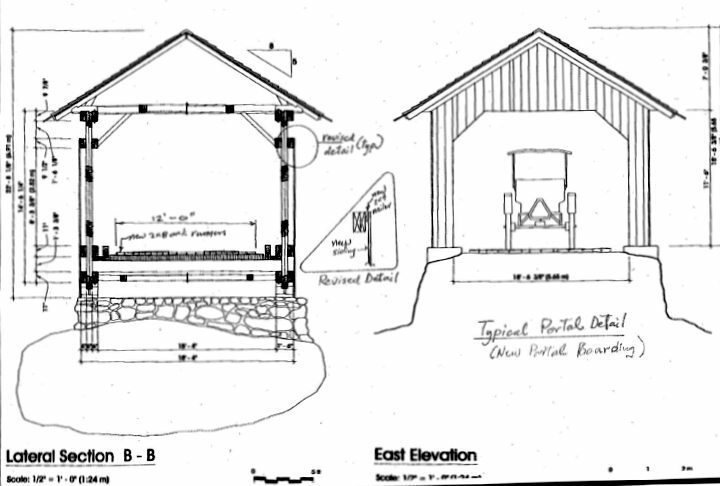 From the the Vtrans Historic Covered Bridge Committee meeting held September 20, 2013. Vermont Agency of Transportation has been assigned the task of preparing an engineering study for the Brown Covered Bridge in Shrewsbury, Vermont. 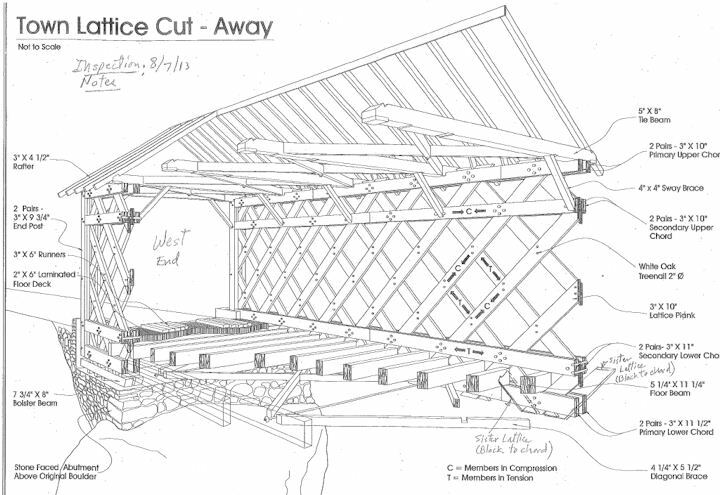 The Project's Priority of Uses as defined by the Historic Covered Bridge Preservation Plan is "Limited Vehicle Use". In this case vehicles are limited to eight tons. The project will be presented at the meeting of the Historic Covered Bridge Committee and all review comments will be incorporated into this study. The purpose of this Engineering Study is to present rehabilitation recommendations for bridge No. 34 (Brown Covered Bridge) over the Cold River in Shrewsbury, Vermont. This evaluation was conducted in a manner consistent with current engineering manuals and specifications. For those readers not familiar with engineering and/or covered bridge terminology, a glossary of terms has been included in this study. The Engineering Study was compiled after the review of numerous sources of data including the previous rehabilitation plans, and field measurements and photographs taken during the site visits by Vtrans personnel. The intent of this study is to evaluate structural deficiencies and to recommend solutions which best accomplish the project purpose and need. 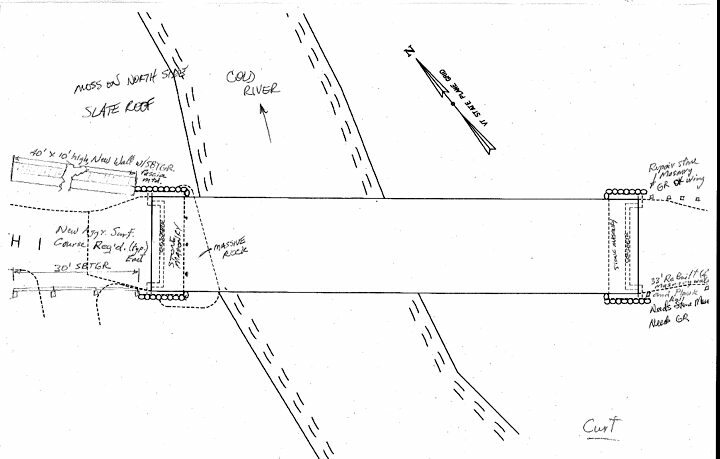 The study does not address restoration or barricading of the washed out access road to the west of the covered bridge. 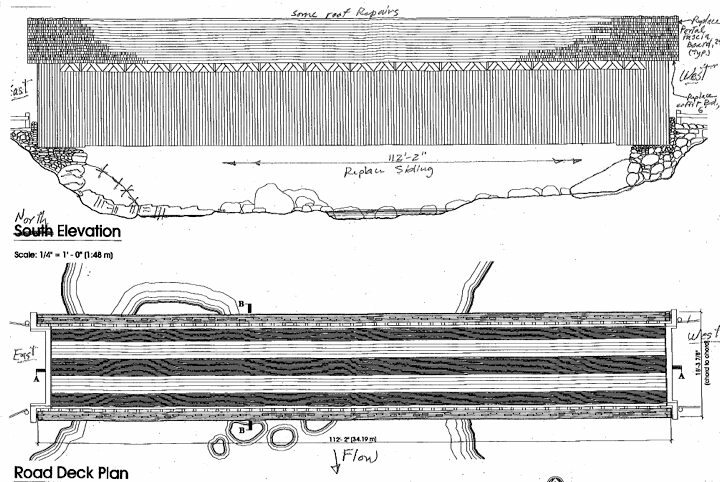 For purposes of this study, north is taken as perpendicular to the bridge in the downstream direction, bridge members are indicated sequentially from west to east and all members are wood unless noted otherwise. 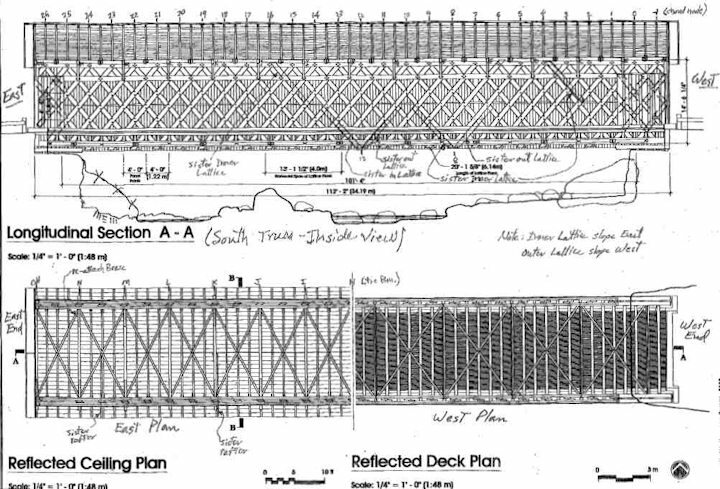 The purpose of the project is to evaluate the Brown Covered Bridge for continued Special Use on Roads (limited to 8 tons) crossing the Cold River in Shrewsbury, Vermont. The Brown Covered Bridge was last inspected by Vtrans personnel in August of 2013. They determined that the condition of the bridge would require repairs to the Town lattice superstructure and some reconstruction of the dry masonry substructure units. Complete replacement of the superstructure elevation and portal boarding is also required. The Brown Covered Bridge was built in (approximately) 1880 and is a single span Town lattice bridge of 112'-2", end to end. The bridge has been repaired various times throughout its lifetime, but appears to have maintained its original character of construction. Vtrans personnel have recently visited the site on various occasions. At the last site visit in August of 2013, a more detailed inspection occurred and Items of Repair Work were noted to be addressed. The slate roof is in generally fair condition, only requiring spot repairs. A number of shingle locations were estimated for repair. The roof boarding appears to be in fair condition. A number of 3x4½ rafters were noted for timber sister repairs. A 6 foot length replacement of soffit board was noted for the northwest corner of the roof eve. Soffit boards at the portals are also recommended for replacement. The upper bracing appears to be in fair to good condition with only minor repair required to re-attach a lateral brace near the east portal. At various locations truss lattice members were noted to be split and/or broken. Some of this damage appears to have happened during Tropical Storm Irene in 2011. A number of locations were noted for lattice sister repairs as well as epoxy repairs. Floor beams and flooring members appear to be in fair to good condition. To enhance safety, new full width oak plank runners are recommended to be installed within the bridge superstructure. The board siding appears to have been heavily damaged during the Tropical Storm Irene event. Most of it requires replacement. This being the case, it is recommended that all bridge siding be replaced, and that 2x4 nailers also be installed to frame the new siding off the truss chords - something that was not done previously. The portal boards are being recommended for replacement to match the new siding. The west abutment is situated on a large boulder and appears to be in fair to good condition. The northwest wing is constructed of poor rubble masonry and requires complete dry masonry re-building. The reconstructed wing will be 40' long. There is no southwest wing, this area is simply stone filled and appears to be satisfactory and stable. The east abutment is constructed of dry stone masonry and appears to be in fair condition. The damaged southeast wing stone masonry will require complete reconstruction for an estimated 33' length. Adjacent to the southeast wing base is an area which will require new fill protection. 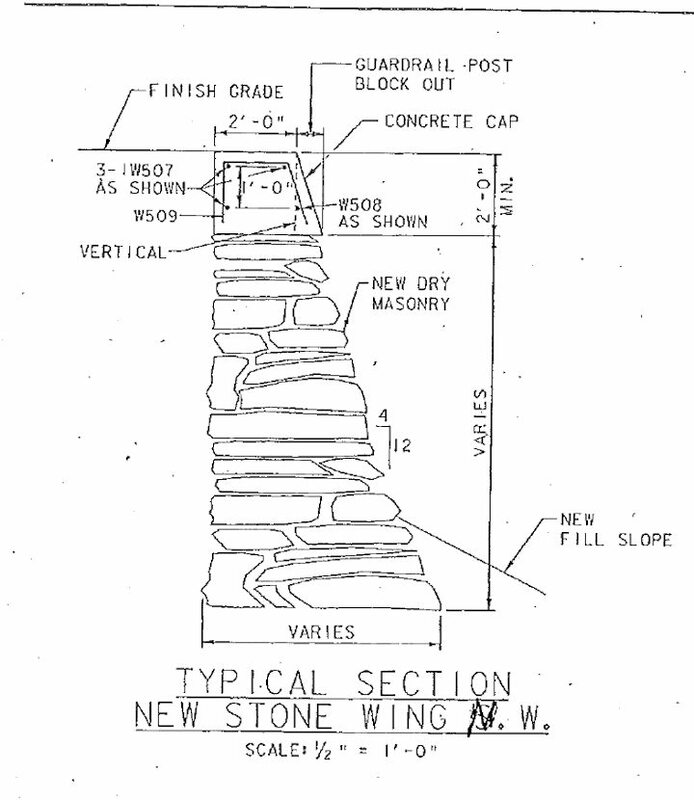 The northeast wing requires some dry stone masonry repair. The west approach road is washed out some distance from the west end of the bridge. Repair of this road and temporary barricading are beyond the scope of work for this project. 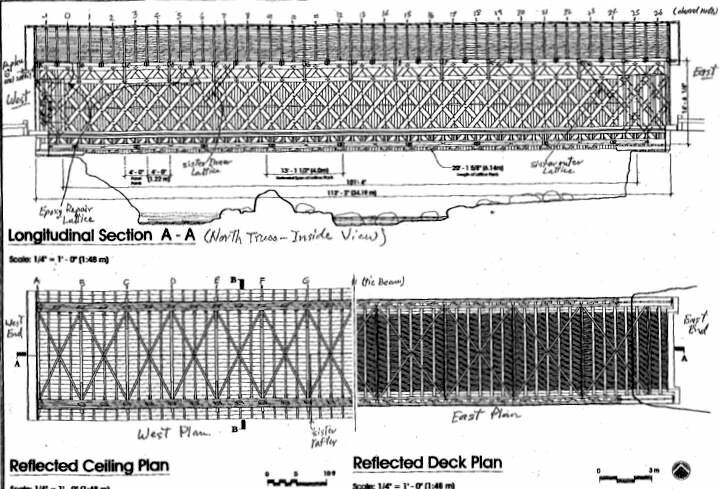 Northeast and southeast of the west portal of the bridge, new steel backed timber approach railing is proposed. New permanent traffic signs (to replace those destroyed by the flood 2011) will be installed. The existing northeast approach steel backed timber rail appears to be in fair condition. The (previous) southeast plank approach rail has been destroyed and will require complete replacement for 25 feet. New permanent traffic signs (to replace those destroyed by the flood of 2011 or otherwise defaced) will be installed.